LAS VEGAS—Freescale Semiconductor wants users to develop and test their own wearable devices with a mini-computer. ”Companies can use this platform as a basis for their own wearable product and invest their resources into innovation and differentiation instead,” said Robert Thompson, director of consumer business development for microcontrollers at Freescale. The Warp—which stands for “wearable reference platform”—is like a miniature version of the Raspberry Pi, an uncased Linux-based computer the size of a credit card. But with features like wireless charging, the Freescale computer is tuned for low-power wearable devices that have wireless connectivity and can be worn around the body. The Raspberry Pi is more for robots, PCs, smartphones and tablets. ”[Warp] provides the building blocks ... that addresses the key challenges seen by wearable device manufacturers—connectivity, battery life, miniaturization, and usability,” Thompson said. 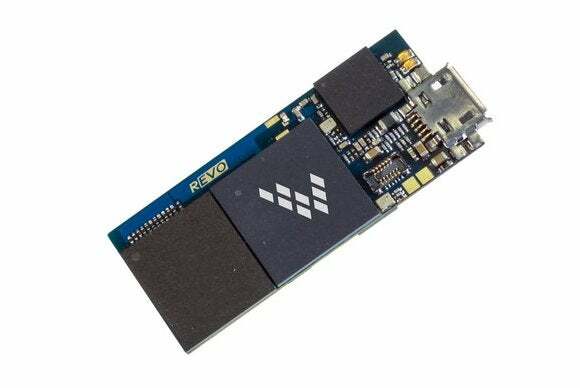 Warp has the key wireless, memory and throughput components incorporated on the main board or expansion cards. But at $149, it could be deemed much more expensive than the Raspberry Pi, which is priced from $25 to $35. ”Raspberry Pi is a great board, but if a developer wants to develop a product based on its key components, they are either not available for purchase or available at greatly inflated prices compared to the $35 cost of Raspberry Pi,” Thompson said. The development kit was announced ahead of this week’s International CES, where wearable devices are expected to dominate the floor. Products on display will include health monitors, smart glasses for augmented reality, clothes with sensors, and smartwatches that work with smartphones to provide messages, call notifications, news and weather information. "[Warp] provides the building blocks ... that addresses the key challenges seen by wearable device manufacturers—connectivity, battery life, miniaturization, and usability." An important element in wearable devices is connectivity, and the Warp supports Bluetooth and 802.11 Wi-Fi. It does not support Zigbee, which is used by a wide number of sensor arrays to communicate. Warp also has LCD and E-ink display interfaces, USB, power management features and sensors such as accelerometers and magnetometers. The mini-computer is expandable through add-on cards—also called daughter cards—through which other wearable devices like health monitors can be made and tested. ”We currently have two other daughter cards in planning for launch in 2014 that will enable other usage models including ECG and continuous heart rate monitoring,” Thompson said. ”We are following the Open Source Hardware Association best practices. We will also publish a complete open source version of Android 4.3 with limited functionality,” Thompson said.